FreeLotto.com Reviews - Legit or Scam? FreeLotto.com Reviews – Legit or Scam? FreeLotto.com is a website that gives people the chance to win over 11 million dollars, without paying a penny themselves. FreeLotto.com provides six different possible games to play, and each game is free. You may enter each of the six games once per day, every day. According to their website, FreeLotto has awarded over $96,000,000.00 in cash and prizes since they were established in 1999. In order to sign up with FreeLotto.com, you must be able to provide them with your real first and last name, an accurate email address, and a current postal address. FreeLotto.com is free to their members only if you agree to view advertising on their website and by email. These advertisers and sponsors give FreeLotto the ability to offer cash and prizes without charging their members a fee. You must provide a legitimate, working email address in order to use the website. All results are issued by daily email, and advertisers and sponsors must be able to contact you by email. You may choose to unsubscribe from receiving certain types of emails by using the unsubscribe feature on your Player Profile page. However, if you unsubscribe from all email, then you will no longer be able to play FreeLotto. Finally, FreeLotto does have a paid service, called F.A.S.T. Subscription Service, which allows members to choose the six numbers they wish to play, and they will automatically be played in each game, every day, for 30 days. 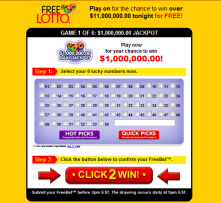 FreeLotto is not really a lottery, but legally is considered a sweepstakes, as members do not have to pay to play. Unfortunately, some states and nations do still have laws which prohibit their residents from using services like FreeLotto.com, so not everyone will be able to participate. Before signing up, members should realize this means they are allowing their contact information to be distributed to partners and sponsors of FreeLotto.com. If you do not want your primary email address to be used in this way, make sure to create a new email address for receiving these advertisements and offers. Some emails may offer goods, services, or special deals to members. Absolutely no purchase is necessary in order to play FreeLotto. If you're at OpportunityChecker.com because you are looking for a way to make money online then check out our article "7 Ways to Make Money Online" - methods that anyone can use to earn an income from home. Average Rating for " FreeLotto " is 2.28 out of 5 based on 46 reviews. Hi how to claim prize i always received email containing the winner name list of freelotto result and may name is 3 times on it and there is highlight word "eligible" others name highlight was paid..what should i do to get paid? I have been playing FreeLotto.com for years. I have won $1 winnings repeatedly, a few $5 winners, a $300 drawing for getting 5 out of 6 in the $1million drawing. The checks for these arrived within the stated time (60-90 days). Each of the smaller winning amounts arrived as well, in clusters. My husband was emailed that he won the Oct 5th $1000 weekly drawing in 2018, but we still have not received that, in spite of having sent all the required forms. We are having trouble getting anyone to respond to emails for that drawing, and get voicemail when we call their number on the site. We are still hoping to receive the $1000, but are also looking to contact NY state fraud investigators if we do not. I'd say go ahead and play, never give banking or credit card information, and keep any copies of emails from them and all copies of any paperwork you submit to them when they indicate that you won a prize. Submit everything by Priority Mail so you have a tracking and a delivery date verified. I won March 2018 is did take a long time but I did get paid the problem is they still owe me my last payment I have been waiting for 3 months I wish they would just pay me. The negative aspect of freelotto.com is that winnings are not paid in a lump sum and you have to provide an attested document to prove your current address every year via post in order to receive your annual installments in case you win the jackpot. This means the money is not guaranteed especially for people living in countries with unreliable postal service. how did you process claiming your prize bro? I won $1.00 twice this year in February & June 2018 but have not received a penny even afta giving my information. Honestly, i think it is spam.So,i just unsubscribed from their e-mails and it is really tough to win.Only played for ten months from Oct to July this month and it is tough to get either all six numbers or the last seven numbers correct I assure you,Ooooh! Thanks guys. Just tried to sign up until I read bad reviews. Its a scam definitely. I have no postal code i live in ethoiopia.i winned 3500&$... What can i do.. Whether you’re trying to make it as a professional blogger or affiliate marketer try following these six tips to get the most out of your online business. There’s no doubt that personal finances are on top of everyone’s list of concerns these days, more importantly the topic of how to save money. Michale C. on Oxford Club Reviews – Legit or Scam? Neecie35 on Panel Bucks Reviews – Legit or Scam? Jim on New USA Funding Reviews – Legit or Scam? Henry King on Panel Payday Reviews – Legit or Scam? Jesters Win Casino Reviews – Legit or Scam? SurveyWorld Reviews – Legit or Scam? Gemini Software System Reviews – Legit or Scam? 30 Minute Money Methods Reviews – Legit or Scam? Lottery Defeated Reviews – Legit or Scam?